Peter on the Chase was illustrated as an assignment for an online webinar-workshop with Giuseppe Castellano. I am working on re-developing my portfolio to my strengths (watercolor) in children’s illustration and this was an addition and a personal awakening. The assignment was to do an homage illustration in honor of Beatrix Potter. After playing with several characters, Peter Rabbit has always been keystone hero of her collection. 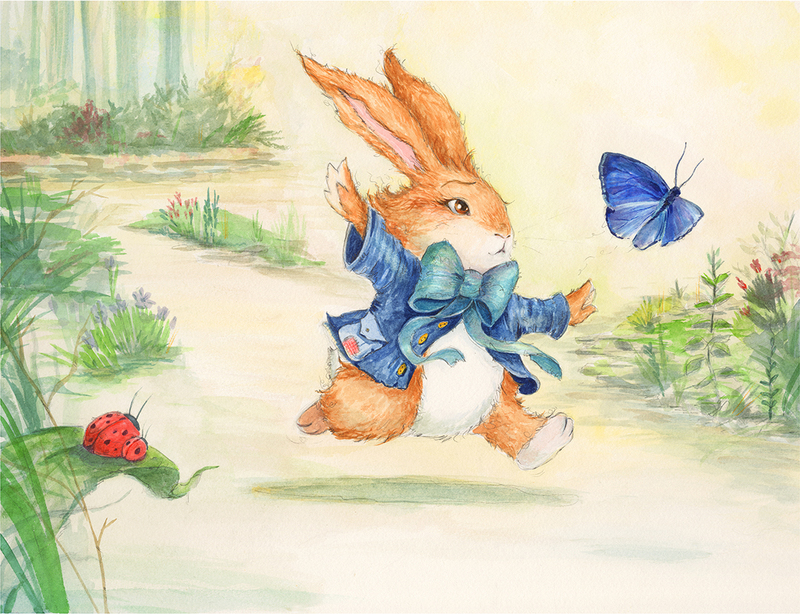 Here, we see Peter in play, distracted by the lovely butterfly, as he wanders down the path. Recreating such iconic imagery in one’s own visual language, was the best part of the challenge. To keep your own unique voice and to still carry the Potter-esque charm, was the best part of the assignment and I found it delightful to bring to life. I enjoyed sharing the love I had for these characters and images as a child while expressing Potter’s place in my own heart of illustrations.